The OSCE Special Monitoring Mission (SMM) to Ukraine has reported about serious escalation of the security situation on Donbas, including due to the use of artillery systems and mortars, prior to a new round of the Ukraine-Russia-OSCE Trilateral Contact Group's peace talks in Minsk on March 2. "The SMM observed a significant increase in ceasefire violations in Donetsk region as compared with the previous day," the mission said in its update on Tuesday, which is based on information received as of 19:30 local time on February 29, 2016. "In the evening of February 28 whilst in the Donetsk People's Republic ("DPR")-controlled Donetsk city center, the SMM recorded 95 undetermined explosions west of its position. While positioned at the "DPR"-controlled Donetsk central railway station (6km north-west of Donetsk city center), on February 29 the SMM heard more than 174 explosions assessed as caused by artillery and mortar rounds," the OSCE SMM said. OSCE monitors also reported two undetermined blasts and impacts; 25-35 single shots and hundreds of rounds fired from a range of weapons including small arms, light and heavy machine-guns, 30mm cannons, and automatic grenade launchers from distances of 0.5-10km from the south, west, south-south-west, north, north-north-east, and north-north-west of its position. During the evening and night hours of February 28-29 whilst in government-controlled Svitlodarsk (57km north-east of Donetsk), the SMM recorded 54 undetermined explosions and 50 single shots of small arms 4km south-east of its position. Whilst 2km north-west of "DPR"-controlled Debaltseve (58km north-east of Donetsk), on February 29 the SMM heard ten undetermined explosions 8km north-west of its position. In "DPR"-controlled Oleksandrivka (19km south-west of Donetsk), over a two-hour span, the SMM recorded 43 undetermined explosions and six bursts of 23mm cannon fire at locations 3-7km west, north-west, and north of its position. Whilst near "DPR"-controlled Petrovskyi district (16km south-west of Donetsk), the SMM heard 21 undetermined explosions and 34 bursts and 50 single shots of small arms south-west and west of its position. Over the course of two hours, whilst in government-controlled Maryinka (23km south-east of Donetsk), the SMM heard 23 undetermined explosions and 21 bursts of small-arms and heavy-machine-gun fire 1-2km north-east and 38 undetermined explosions and 15 shots from an automatic grenade launcher 3-6km north-east of its position. In the vicinity of "DPR"-controlled Zaichenko (26km north-east of Mariupol), over a two-hour period the SMM recorded over 50 undetermined explosions and intensive firing from mortar, artillery, and small arms approximately 4km west of its position. In Luhansk region, the SMM observed ceasefire violations near government-controlled Triokhizbenka (33km north-west of Luhansk), which it attributed to live-fire exercises. Whilst positioned 2km north-west of government-controlled Troitske (69km west of Luhansk) over the course of an hour, the SMM observed an anti-aircraft gun (ZU-23), approximately 200-300m west of its position, firing several bursts at unknown targets to the south-east; heard two undetermined explosions 5-7km west of its position; and heard 11 undetermined explosions 5-10km to the east of its position. 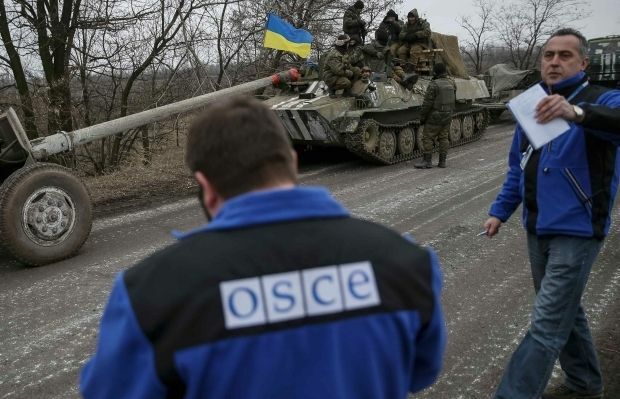 The new round of the Ukraine-Russia-OSCE Trilateral Contact Group's peace talks on the settlement of the Donbas crisis will be held in Minsk on March 2. The previous rounds were held on February 17 and February 24.